I'm sorry I have been away from my blog for so long. I wasn't sure if I was going to write again but then I heard about plans to celebrate school meals from around the world! I love looking at what other children eat for their school dinner and what they think about it. Although dinners look different and taste different they are important to all children. 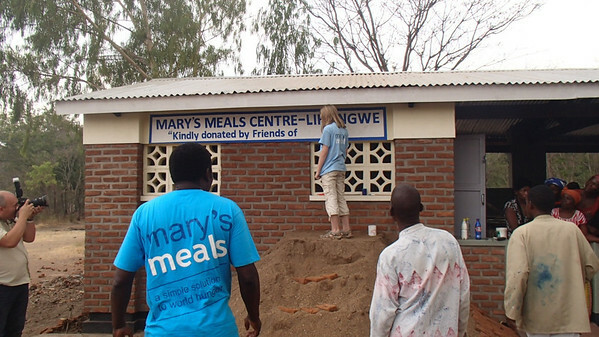 For some children it's their main meal, like in Malawi with Mary's Meals and the 'Friends of NeverSeconds' kitchen. The big idea I heard about is International School Meals Day and it's coming very soon! The website launches on the 1st February and the actual day is on Friday March 8th. Lots of countries are involved and there are some brilliant ideas. I am going to pick out my ten favourite meals that I have been sent. Please send in yours to share to NeverSeconds@gmail.com. There will also be an update from Lirangwe, Malawi, on the 'Friends of NeverSeconds' kitchen (we have raised nearly £129,000, thank you!). I'm also going to try and cook some recipes from around the world. There is a new book about children cooking around the world that I want to try. I will probably get more ideas from the website InternationalSchoolMealsDay.com when it opens. I don't use Twitter, my dad does, but you can follow @IntSchoolMeals and #ISMD2013. I am going to blog until the big day, honest, because i have missed writing. This is the first International School Meals Day and people have shortened the name to ISMD but that sounds like 'is mud' to me! Glad to hear from you again! I love your posts. I am glad to hear you missed writing, because I certainly missed reading your blog. Reading the "Never Seconds" book helped a bit, but it's more fun to come back and read about how much will be happening in the next few weeks! VEG, I hate to tell you this, but you've created a monster!!!!!!!!!!!!!!!!!!!! For the record, this is a good thing! Keep up the good work! We need you, as a student, to provide the administrators with reality! Thank you, thank you, thank you==there were far too many TRULY AWFUL holiday meals! BTW--I only wish my college students were as aware as you! Love you! Keep up the good work! Welcome back VEG, looking forward to reading your blog over the next few weeks. Welcome back VEG! Loved your book. Hello VEG and good to see that you blog is still alive. Keep going, we need you! So glad to have you back Veg! Love the idea about international school meals day! I hope you write from time to time. One doesn't need to blog daily to be a "real blogger." It's more important to write well when you *do* write. Like AEH said above, your posts are great, and it's always fun to see you pop into my reader. Try new topics too! 4th grade is a little early to get locked into a single topic. I've missed your posts! I check several times a week to see if you've written more. I hope you continue to write! very glad you are back. I've missed you posts. Interesting site. I enjoyed reading this and I'm going to investigate more. you must be doing good work to be recognized on a national news website. Keep it up! Yay! Nice to hear from you again.... I am still reading your book on my Kindle! Carry on the fantastic work! Nice to have You back, Veg.. So, how's school dinner at Your school lately? Would be great to see if anything has changed for the better. Great to see you writing again. Yes, I love seeing the pics of food from around the world too - I remember some great Korean ones (I think) from when you started the blog. They had loads of green veg, and looked very tasty. Looking forward to International School Meals Day. Ditto what everyone else said, Veg! I have missed your posts and am so glad to see you back again! Ditto what everyone else said, Veg! I'm so glad to see you back and have missed your posts! Glad to see you back! I always enjoy your posts. Remember, as Bill Storm says, you don't need to write every day - but we'd like it if you keep us informed about your school dinners, and how the Friends of NeverSeconds kitchen is doing. I saw you on Japanese TV! Glad to visit your site. I think what you've done and what you are doing is absolutely brilliant!!! Two days before my birthday last year, I became an uncle. My sister and her man are both teachers and I can see that in about 4-5 years, school meals are going to become an important issue. I have no children of my own so suddenly for the first time in over 35 years I find myself wondering what will meals at school be like for my little nephew. I have always felt that helping people in poorer countries to feed their children is very important but now I have a selfish reason to be concerned about the nutrition of school children in my own country. Fantastic, brilliant, inspiring and many other words describe what you've done and are doing. Thank you for making school meals and the nutrition of children a big issue. What a nice surprise to see you back, Veg. I've missed you and I look forward to reading your posts again. We bought copies of your book as Christmas presents for family and friends and I even gave away my copy (half-read) over Christmas. I have been meaning to buy another - I shall do so now! :-) Looking forward to reading lots more from you.